You really know you like a product when you finish it off completely and buy it again! It is with great satisfaction both mentally and financially that I present to you, my re purchased products for September. Weirdly enough most of these are hair products, I think of my self as a “skin obsessive” person, but it seems the obsession is moving onto another area! Wellaflex Hair Spray – First and foremost I used this can for ages, over and over again and it kept giving and giving. After creating some waves with the curling iron, I spray Wellaflex all through my hair. It leaves your hair bouncy and holds it together on those hot humid summer nights. Believe me in Malta we have a full 90 days to enjoy of these nights! No sticky residue, no frozen looking hair, just a natural finish. L’Oreal Age Perfect Extraordinary Facial Oil – Now this was a purchase that I was not confident about cause in my 20’s what I wanted is less oil on my T freaken Zone! However reaching 30’s my aim is to have a healthy glow and constant hydration. As facial oils are a HOT topic right now I thought I would use a brand I was familiar with. All you need are 3 drops in the morning and 4 in the evening, massaged into your skin, left to sink in and then apply your moisturiser. My skin feels and looks hydrated day and night! I also wake up feeling like my face had a moisture rush through the night. So this was another purchase I absolutely love. 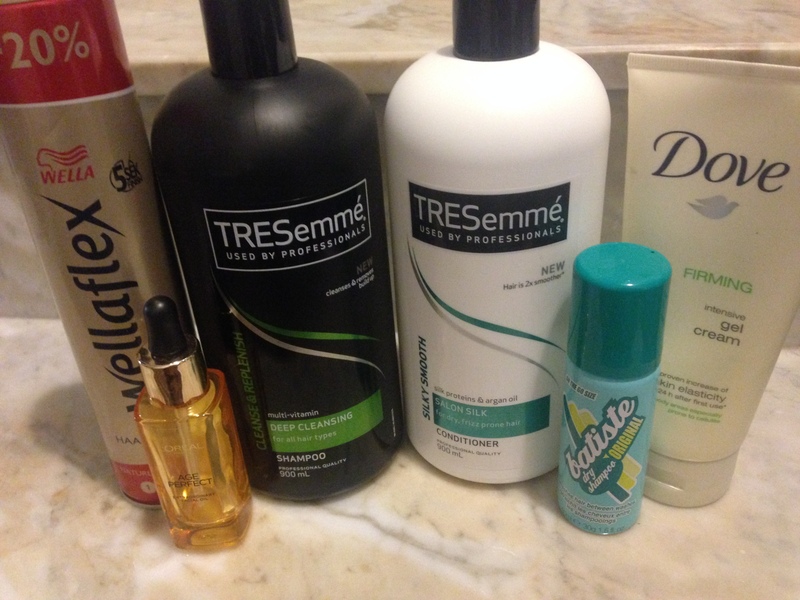 Tresemme Shampoo & Conditioner – For a long time Tresemme was and is my favourite hair shampoo. Their range is so vast that I can always accommodate the state of my hair at that particular point in time. Example if I just coloured my hair I will purchase the colour friendly range or if it is the end of summer I prefer using something more moisturising and replenishing.It cleanses well and leaves your hair smell wonderful for a good couple of days! You also can not beat the price. Re Purchased. Done. Dove Firming Cream – Bikini Season = Firming Cream. Short Dress = Firming Cream. Tight Dress = Firming Cream. Leather Look Leggings = Firming Cream. Do I need to say more? The consistency of the cream sinks in your skin within a couple of minutes, it just becomes part of your skin. Makes the skin feel softer and look smoother for a good 24 hours. This is a feel good cream to use when you might not be soooo confident to show off your legs after you had a cheese puff feast! Definite Re Purchase Done. Batiste Dry Shampoo – This was a trial size. To be totally honest I was never keen to put dry shampoo, I thought I would have a massive product build up after using it, however my friends raved about it, so I tried it. Took it to the gym and I purposely, forced myself not to wash my mop of hair, sprayed it around my roots, left it to dry for a couple of seconds and brushed it off. That was not bad at all!! Did not last long as it was tiny, but it was enough to convince me to keep one handy just in case I don’t have 5 hours to go through my hairy head! So there it is, products that are great value for your pocket and that will give your excellent results!